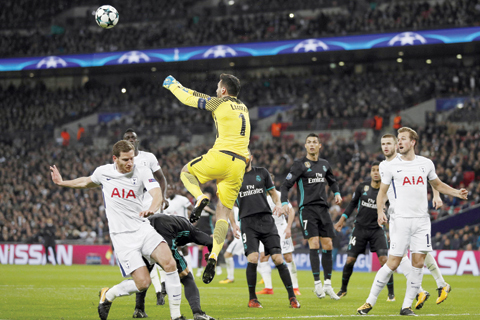 LONDON: Tottenham stunned Champions League holder Real Madrid with a 3-1 victory on Wednesday to qualify for the knockout phase for only the second time and increase the pressure on coach Zinedine Zidane. European champions in three of the last four seasons, Madrid hadn’t been beaten in the group stage for five years, and the humbling in London came straight after Madrid’s Spanish league defense was hit by a surprise loss at Girona. Madrid’s fragile defense was torn apart too easily by Tottenham, a club that hasn’t won the English league since 1961. Dele Alli, suspended for the opening three games in Group H, made an explosive return to the Champions League with two goals. The victory took Tottenham three points clear of Madrid at the top of the group, ensuring passage into the last 16 with two games to spare. Tottenham has only competed in the knockout phase once before in the 2010-11 season when it was eliminated by Madrid in the quarterfinals. Then, Madrid beat Tottenham 5-0 on aggregate but the tables have turned. Last month, Tottenham secured a 1-1 draw in the Spanish capital and now it has beaten Madrid for the first time as Zidane endured one of the most painful games of his 22-month reign. “I am not worried and I never will be worried this season, whatever happens on the pitch,” Zidane said through a translator. Tottenham’s victory came almost seven years to the day since it beat another reigning European champion – Inter Milan – 3-1 in the group stage on Nov. 2, 2010 at White Hart Lane. Mauricio Pochettino’s team was dumped out in the group stage last season, but now looks far more adept among the continent’s elite. Madrid was outclassed from the start on its first visit to Wembley Stadium, which is Tottenham’s temporary home while White Hart Lane is being redeveloped across north London. Spurs started with concerns about the fitness of Harry Kane after losing their last two games without their top scorer. But even their striker having an off night wasn’t an issue. Even if Alli wasn’t commanding throughout behind Kane, it wasn’t an issue. Kane made a difference when it mattered. Another English youngster, Harry Winks, was the architect of the opener. A chipped pass to Kieran Trippier was in turn squared across the penalty area for Alli to squeeze into the net in the 27th. This was a night of frustration for Ronaldo, summed up shortly after Alli’s goal when he hit the side netting and shot straight at goalkeeper Hugo Lloris. Ronaldo put his head in his hands.